The Game Changers mobile collecting donations before the kick off at a 2014 Chargers game. SAN DIEGO, CA (September 10, 2015) – Union Bank and the San Diego Chargers have again teamed up for the “Game Changers” fundraising program, which launches Sunday, September 13 prior to the Chargers’ game versus the Detroit Lions. This year’s program will help raise funds for Casa de Amparo, one of the leading centers for the prevention of child abuse and neglect, and fans are encouraged to help make a difference in the lives of at-risk children and end cycles of abuse. 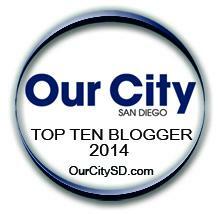 Child abuse and neglect are serious problems nationally, statewide and in the San Diego community. The San Diego County Health and Human Services Agency reports that approximately 70,000 reported cases of child abuse and neglect are reported in San Diego annually. San Diego County has the second highest rate of substantiated referrals among all counties in California. 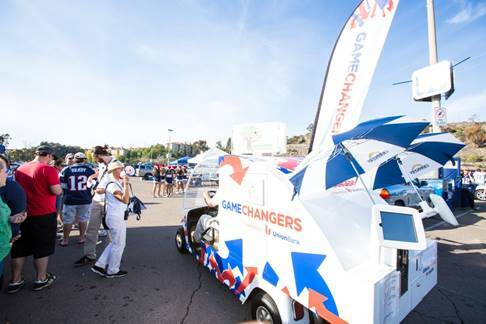 Qualcomm Stadium before the game, Game Changers encourages Chargers fans to contribute their loose change and dollar bills to the one-of-a-kind Game Changers Mobile. Now in its third year, the Game Changers program seeks to raise more than $5,000 in fan donations during the 2015 season. Union Bank, through the MUFG Union Bank Foundation, and the Chargers have each pledged to match all donations up to $5,000, for a total of $10,000. By donating to Casa de Amparo through Game Changers, fans will help serve more than 1,000 Casa Kids and young adults, from prenatal to 25 years old, as well as more than 700 families, through six integrated programs that promote healing, growth, and healthy relationships. These programs include: Residential Services, Counseling Services, Family Visitation, Hayward Child Development Center, New Directions, and Young Parent Network. Casa de Amparo is the San Diego Chargers Courage House, part of a national network of NFL teams and local charities dedicated to the prevention of child abuse. The Game Changers Mobile can also be found driving around the Qualcomm Stadium parking lot before home games for the remainder of the 2015 regular season. As part of Game Changers, fans will have a chance to win a variety of prizes that will boost their Chargers experience – the Game Changers Mobile comes stocked with premium items, such as football gear signed by Chargers players, including Eric Weddle, Manti Te’o and Brandon Flowers. Fans will also have opportunities to win upgraded seats to watch the Chargers play that very day. For information about Game Changers and a list of rules and regulations, please visit http://www.unionbank.com/gamechangers, find us on Facebook at http://www.facebook.com/unionbank or on Twitter @unionbank. Established in 1978, Casa de Amparo (Home of Protection) is recognized as a leader in treating and preventing child abuse and neglect in San Diego County and beyond, with locations in Oceanside and San Marcos. The non–profit organization annually serves over 1,000 Casa Kids, from prenatal to 24 years old, as well as 750 families and 450 adults, through six integrated programs that promote healing, growth, and healthy relationships. These programs include Residential Services, Counseling Services, Family Visitation, Hayward Child Development Center, New Directions, and Young Parent Network. Casa de Amparo is the San Diego Chargers Courage House, part of a national network of NFL teams and local charities dedicated to the prevention of child abuse. The San Diego Chargers originated as the Los Angeles Chargers of the American Football League in 1960. The team relocated to San Diego in 1961 and captured the American Football League championship in 1963. It finished first in five of the 10 AFL seasons. Since joining the National Football League when the two leagues merged in 1970, the Chargers have won 11 AFC West division titles, including five titles in the last 11 seasons. Overall, the team has played in 28 playoff games. The Chargers were purchased by construction leader and real estate developer Alex G. Spanos in 1984 and has been under the guidance of Spanos’ eldest son Dean, the team’s current Chairman of the Board, since 1994. That same season the team won the AFC Championship and played in Super Bowl XXIX. The Chargers are Southern California’s only NFL franchise and all Chargers games are annually the highest-rated television programming in San Diego. The Chargers play their home games at Qualcomm Stadium and the Spanos family, nationally renowned as one of San Diego’s and the NFL’s most philanthropic families, has invested millions of dollars in an effort to secure a new Super Bowl-quality stadium for San Diego. MUFG Union Bank, N.A., is a full-service bank with offices across the United States. We provide a wide spectrum of corporate, commercial and retail banking and wealth management solutions to meet the needs of customers. We also offer an extensive portfolio of value-added solutions for customers, including investment banking, personal and corporate trust, global custody, transaction banking, capital markets, and other services. With assets of $113.5 billion, as of June 30, 2015, MUFG Union Bank has strong capital reserves, credit ratings and capital ratios relative to peer banks. MUFG Union Bank is a proud member of the Mitsubishi UFJ Financial Group (NYSE: MTU), one of the world’s largest financial organizations with total assets of approximately ¥284.9 trillion (JPY) or $2.3 trillion (USD)¹, as of June 30, 2015. The corporate headquarters (principal executive office) for MUFG Americas Holdings Corporation, which is the financial holding company and MUFG Union Bank, is in New York City. The main banking office of MUFG Union Bank is in San Francisco, California.